VANCOUVER, BC / ACCESSWIRE / August 2, 2018 / Gainey Capital Corp. (TSXV: GNC) (OTC PINK: GNYPF) ("Gainey" or the "Company") is pleased to announce that it has entered into an option agreement with First Mining Gold Corp. ("First Mining") granting Gainey the right to earn a 100% interest in the Las Margaritas property located in the State of Durango, Mexico. The property is located approximately 140 kilometres to the southeast of Mazatlan, Sinaloa and is comprised of two mineral concessions encompassing a total of 500 hectares. As shown in the map below, the concessions lie to the north of Gainey's El Colomo project and within El Colomo's overall claim package. Location of the Las Margaritas Property relative to existing exploration properties and mines. Prior surface work on the Las Margaritas property by the Servicio Geologico Mexicano (Mexican Geological Survey) and First Mining identified a vein system extending for at least 1,500 metres along strike and averaging approximately 1 metre in width. Numerous prospect pits occur along the structure where gambusinos (Mexican prospectors) have worked the vein for high grade gold. With no evidence of prior drilling on the claims, the property represents a grassroots, high grade gold target, most likely of underground configuration. In addition, as per the terms of the option agreement, Gainey will make annual cash payments to First Mining of USD$25,000 from September 2018 to September 2020, and USD$250,000 in September 2021 in connection with an existing agreement on the property, and will incur exploration expenditures on the Las Margaritas property totaling USD$1,000,000 over the four year option period. Upon completion, Gainey will obtain 100% ownership of the Las Margaritas project and First Mining will retain a 2% net smelter returns ("NSR") royalty, with Gainey having the right to buy back 1% of the NSR royalty for USD$1,000,000 up until the first anniversary of the commencement of commercial production at the project. 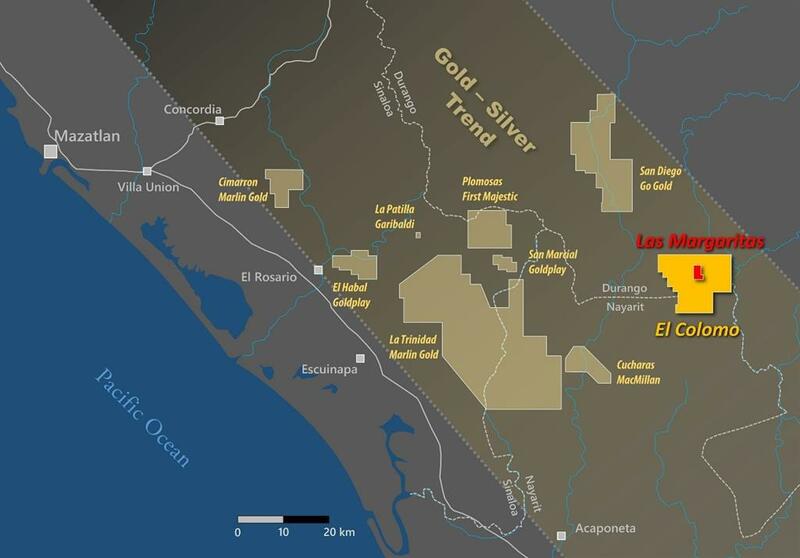 David Coburn, Gainey Capital's CEO commented, "The signing of this option agreement with First Mining Gold is the culmination of several years of discussions and negotiations regarding the Las Margaritas Property. We are now looking forward to advancing and exploring what may prove to be the most interesting portion of the El Colomo district." Gainey anticipates initiating preliminary exploration work on the property in early August, including mapping, sampling, drill target definition and permitting. The transaction and the issuance of Gainey's common shares pursuant to the option agreement is subject to acceptance by the TSX Venture Exchange. Brian Metzenheim, the Company's Vice President, Exploration, is the "Qualified Person" for the purposes of National Instrument 43-101 Standards of Disclosure for Mineral Projects and he has reviewed and approved the technical information contained in this news release. FORWARD LOOKING STATEMENTS: This press release may contain forward-looking statements. Forward-looking statements are statements that are not historical facts and are generally, but not always, identified by the words "expects", "plans", "anticipates", "believes", "intends", "estimates", "projects", "potential" and similar expressions, or that events or conditions "will", "would", "may", "could" or "should" occur. Although the Company believes the expectations expressed in such forward-looking statements are based on reasonable assumptions, such statements are not guarantees of future performance and actual results may differ materially from those in forward looking statements. Forward-looking statements are based on the beliefs, estimates and opinions of the Company's management on the date such statements were made. The Company expressly disclaims any intention or obligation to update or revise any forward-looking statements whether as a result of new information, future events or otherwise.